It appears City have an allocation of around 1900 tickets for the Floors-2-Go Stand. There are seats on the upper level and a terrace below. 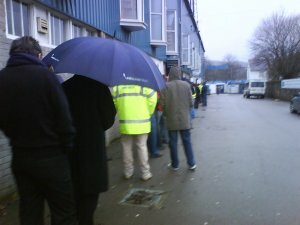 A healthy queue had gathered when the ticket office opened for business this morning. Tickets are on sale to Ambassadors until end of play on Wednesday with Season Ticket holders and Members able to purchase remaining tickets on Thursday. That is if there are any left.